Chapter 13 is a valuable tool in the shed of a potential debtor. In general it allows a debtor as much as five years to cure mortgage arrears (and thus stop a foreclosure by a bank), or to pay non-dischargeable tax debt. If a debtor cannot qualify for Chapter 7 because, for example, she does not qualify for liquidation under the Means Test, Chapter 13 is very often the best option as well. However, Chapter 13 has limits of its own. Specifically, Chapter 13 bars individuals with TOO MUCH debt from relief. Currently a debtor is barred from seeking relief under Chapter 13 if either her unsecured debt is more than $383,175.00, or her secured debt is in excess of $1,149,525.00. See Bankruptcy Code § 109(e). The limits were originally set at $250,000.00 (unsecured) and $750,000.00 (secured), and are adjusted every three years under the code to keep relatively current with inflation. See Bankruptcy Code § 104. These limits will next be reviewed in 2016. If you do appear to be over the limit for either unsecured or secured debts, there may be some strategies available to allow you to still qualify. An in-depth analysis of your debts should be undertaken by your bankruptcy attorney to determine if a portion of your debt may not count toward the limits, or if some of your debt can be re-categorized, in part or in whole, as secured or unsecured. Strategies for meeting the threshold. Bankruptcy Code § 109 specifically sets these limits for “noncontingent, liquidated unsecured debts” and “noncontingent, liquidated secured debts”. So it follows that if the debts are contingent or un-liquidated in nature then they do not count toward the limits. A contingent debt is a debt that one does not have a current obligation to pay; that is to say it is a debt that one only becomes liable for upon the happening of a “contingency” or event in the future. A typical example is when one signs a personal guaranty for a loan to a business. The individual guarantor in that situation is only liable to the lender upon the default of the borrower business. But be aware not all co-signed debts are really guaranties. In many examples in the personal lending world, a “co-signer” is under the impression that she is only guarantying debts owed by another (such as a parent co-signing on a child’s student loan, or co-signing on your cousin’s car loan, etc.) when in reality the co-signer is jointly liable. In that scenario, the co-signer is immediately obligated, so that the lender could demand payment from either obligor at any time. Accordingly, in that situation, the debt is non-contingent, and is necessarily included in the analysis of debts for the Chapter 13 limits. An un-liquidated debt is a debt to which a debtor’s responsibility to pay has not yet been determined, or where the amount due cannot be easily determined. A typical example of an un-liquidated debt is where a debtor is sued in tort (i.e., for an injury caused to another). While the debtor has been sued — or threatened with suit — for a given dollar amount, either liability has not yet been determined by a court, or if liability has been determined the amount of damages has not yet been determined. Another word of caution, not all lawsuits are created equal. Suits for breaches of contract (particularly for loans, lines of credit and other forms of lending) where there are no real defenses, and the amount of damages is easy to calculate, might not be considered to be un-liquidated. Another strategy is to re-classify some or all of a particular debt. 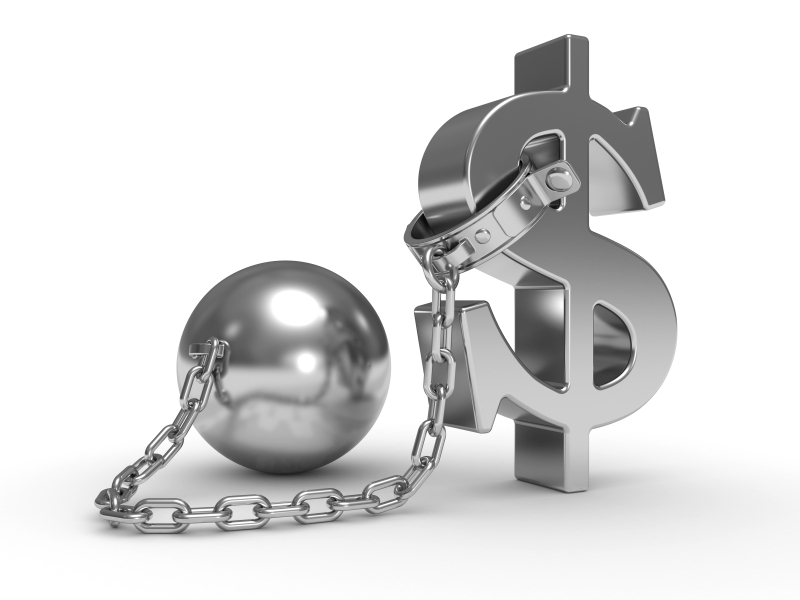 In some situations, certain secured debts can be stripped or “crammed down”. In Chapter 13 mortgages on the debtor’s principal residence cannot be crammed down (i.e., the mortgage is reduced to the value of the property), however real estate that does not constitute the debtor’s primary residence (such as investment property) is fair game for a cramdown. In addition, junior mortgages that are fully unsecured (i.e., where the balance due under the senior mortgage is more than the value of the real estate, the junior mortgage is considered to be “wholly unsecured”) can be stripped off entirely, even on the debtor’s residence. In either of these situations the secured debt (or at least a portion of it in the case of the cramdown) would be re-classified as unsecured debt. This might be helpful for a debtor attempting to qualify for Chapter 13 where the secured debt is over the threshold. However, keep in mind that the amount by which the secured debt is reduced will be equal to the amount by which the unsecured debt is increased. If all else fails, a “Chapter 20” might be the answer. For those of you thumbing through your well worn copy of the bankruptcy code looking for Chapter 20, be aware that you won’t find it in the Code. Chapter 20 just means that we are going through the process of two bankruptcy cases, Chapter 7 and then a Chapter 13 (7+13=20). The initial filing is a Chapter 7 case to clear out unsecured debt, strip certain liens and then a Chapter 13 to deal with mortgage arrears and non-dischargable debts. Beware, Chapter 20 is only available to a debtor who qualifies for Chapter 7. Also, its important to understand that no discharge will be available in the Chapter 13 case, because you will have discharged your debts in the Chapter 7 that just happened, but it might help some to qualify. You will have the benefits of a Chapter 13 in that you can stretch out repayment of mortgage arrears by up to five years. If none of these strategies work, you may need to consider Chapter 11. Chapter 11 is available to individuals and has no debt limitations. It can be a bit of a cumbersome process and is often not cost effective for the average individual filer. However, there are a number of benefits to Chapter 11 that are not available to individuals filing under any other Chapter of the Bankruptcy Code, such as cramming down a mortgage on the debtor’s primary residence, and extending plan payments beyond five years. If you are facing a large amount of debt that makes a Chapter 13 questionable it is imperative that you talk to experienced and qualified bankruptcy attorney immediately. Call the Law Offices of James Wingfield at 508-797-0200, visit the contact page of our website or fill out the form below to schedule a consultation today.